Fairways is located in St Mellion on the exclusive Oakridge estate. Oakridge is a safe private holiday estate adjoining the fairways of the renowned St Mellion Golf & Country Club. Naturally free golf & leisure membership is included. Guests have a private walkway access to the grounds of the club (about 15 minutes walk to the club house). We have two other 2 bedroom properties on the same location, so if Fairways is not available on the dates requested, just contact us or visit out main web site holidaycottagesincornwall.co.uk. Oakridge - 40 acres of heaven in Cornwall: The upside down Scandinavian style design at Oakridge takes maximum advantage of the views over the lovely Cornish countryside and the renowned St Mellion Club golf courses. The views are stupendous. Fairways in particular looks straight onto the 12th fairway of the world famous Nicklaus golf Course at St Mellion. All Oakridge properties benefit from modern well-equipped kitchen with dishwasher microwave etc. Each bedroom has an en-suite bathroom with bath and a built-in shower unit. The delightful lounge area has a wood burning fireplace and with oil-fired central heating central heating means an off-season break will be warm and comfortable. For the summer, barbecues and sunny balconies contribute to the “holiday atmosphere”. High quality furnishings and levels of equipment round everything off nicely! St Mellion facilities: Whether you play golf or just fancy an 'indoors' option when on holiday, then Oakridge is the perfect location. You get 2 golf & 2 leisure memberships (2 adult & 2 children for the leisure club)) as part of your holiday price. This gives you free use of their fantastic leisure facilities. Amazing Golf deal - 2 superb golf courses. The nicklaus is world famous and the brand new Kernow is a real treat to play! The 2 golf passes give free golf for 2 on both courses and extra golfers receive a 50% discount on the Nicklaus & 40% on the Kernow. There are also 2 restaurants & 3 bars. Free wifi is available at the club. Getting around: If you can bare to leave St Mellion you will find that you can get almost anywhere quickly. There are loads of great local country pubs, the beaches are about 20 minutes away. Plymouth is close by for shopping and the nearest supermarket (8 minutes, is a Waitrose. Although Oakridge is very quiet (having its own 800 metre drive helps), it is close to main roads so getting there & visiting the sights is a breeze. Even Penzance is only about 70 minutes away. Eden is 40 and the wonderful Cotehele national trust house is practically round the corner. Sunny rear deck as well as a small balcony with wonderful golf course views. superb stay, just had such a great time. St Mellion is still as great as ever for its golf and the pool is wonderful too. The views from Fairways are just perfect and it is such a lovely place to stay. well equipped, warm, and with decent wifi .We will be back. Thank you. The location was lovely and the heating was good, but the DVD player, CD player and vacuum cleaner did not work, neither shaving light in the bathrooms worked, the towels were very smelly once wet, there were no accessible plugs in the twin room, the saucepans were so scratched they were unusable, the toilet in the twin room took 5 mins to refill, one of the twin beds was very unstable and the duvets were very old and stained. I would not stay here again. Having read this review in some detail, we can only assume that this person did not stay here and has simply made a mistake. We have investigated each criticism thoroughly and (apart from one faulty light bulb) none of it was true. However our main response is for the benefit of future guests, staying at one of our properties or indeed, elsewhere. If something is not right & can be made right, tell the owners / managers. Most have systems in place to rectify minor faults quickly. If any of the faults mentioned in this review had been valid, we could have fixed them within an hour or two. Yet this person (wherever they stayed) chose to just put up with it and then left a poor review. While this might satisfy their desire for some sort of revenge, would it not have been better to ask for these (relatively minor) things to be dealt with. We, like most property owners rely on guest feedback. Our cleaners do a great job, but it is not reasonable to expect them to turn on and test all the appliances and lights in a property while they are trying to prepare it for the next guest to arrive, So there will be occasions when a guest arrives and something does not work. We would apologise for that and get it sorted out and then hopefully our guest could get on with the real purpose of their stay, namely relaxing in the peaceful environment that is Oakridge St Mellion. Enjoyable half term break with family. Even in feb, the st mellion courses were in great nick. Wife and daughter thought the leisure club was awesome too. Inside this is a very nice holiday cottae. Clean, warm with lovely views. Especially enjoyed lighting a fire and enjoying a glass of wine at night. Thoroughly enjoyed our stay at Oakridge. The property is very nice indeed, with the upstairs lounge having these huge windows with views over the st mellion course. The free golf was an amazing bonus, but the pool and gym at the club were also great. We had a great return trip here. All is as was last year with a lovely home in beautiful surroundings. St Mellion memberships were as good as before, wifi seemed even faster! Thanks Frances! We were very happy with accommodation - exceptionally quiet, not overlooked, in a small group of 5 houses each in it's own space. Well equipped kitchen and bathrooms. Lovely views of golf course, we sat enjoying the views and enjoyed the restaurant and spa/ complimentary health centre/ gym facilities at the hotel. 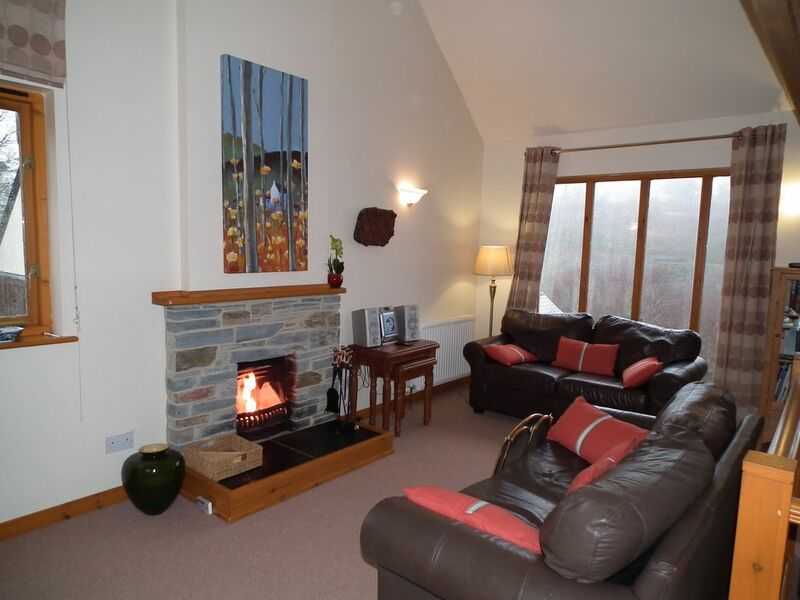 St Mellion is a secluded village in the heart of the SE Cornwall country side. This exclusive 40 acre estate is located right next to the stunning St Mellion international resort (free membership included) with its 2 golf courses, 3 indoor pools, tennis courts gym, spa and much more. There are a variety of local pubs & restaurants within a short distance and the south coast beaches are only 20 minutes away. Oakridge is well away from major roads but is easily accessible with access to a good local road network. •FREE 7 day use of the Kernow Course for 2 people. •FREE 7 day use of the Nicklaus Course for 2 people.